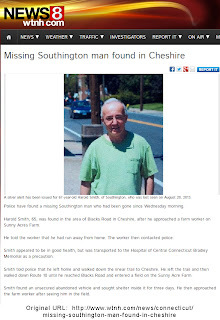 Friday everyone around here was posting on FB that an elderly man, age 67, was missing from Southington, CT, a town about 20 miles away. (Harold) Smith's family members are not sure what he was wearing when he left home, but he almost always wears black sneakers and white socks, according to police. Smith cannot read or write, but he does recognize his name, according to police, and frequents the downtown Southington area and Plantsville Center section of Southington. Although no where does the article say he has dementia, from living with a dad and aunt, I can read between the lines. Earlier versions of the article described him as very "approachable" but for some reason that's left out of this one. I was ready to drive to Southington myself and start looking for him. He's the same age as my dad was when he died and in the picture he's wearing a green shirt. Brought back so many memories of the two times my dad wandered off and how both times it wasn't the cops who found him but ordinary people who were looking like my mom's neighbors. It made me sad that he had been missing since Wednesday and people only started posting his picture on Friday night. Maybe they were hoping he'd turn up. Maybe his family was ashamed. I don't know. Yesterday I was checking on and off all day to see if he'd been found and finally the news came that he was okay. 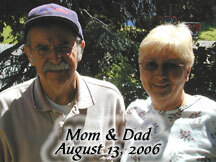 It's been so warm, which is just as worrisome as the freezing cold day my dad took off. I was thinking they'd find him in a ditch or something awful. Harold Smith, 65, [sic] was found in the area of Blacks Road in Cheshire, after he approached a farm worker on Sunny Acres Farm. He told the worker that he had run away from home.... Smith told police that he left home and walked down the linear trail to Cheshire. He left the trail and then walked down Route 10 until he reached Blacks Road and entered a field on the Sunny Acre Farm. Smith found an unsecured abandoned vehicle and sought shelter inside it for three days. He then approached the farm worker after seeing him in the field. Looking at a map, it seems like he wandered at least 5 miles (by normal roads) into the next town. I can only imagine his confusion as he sat in some junky old car for three days. Was he angry at his family, hence the running away? I hope the Smith family hugged him and loved him when he was returned to them and they didn't yell at him. I also hope they investigate some kind of GPS system for tracking him and continue to let him take walks, as it seems like he likes to do.